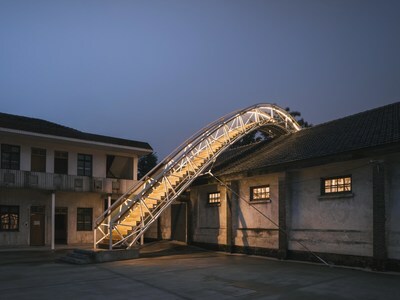 WUZHEN, China, March 28, 2019 /PRNewswire/ -- With the unique ecological environment of Wuzhen Water town serving as the stage, Now is the Time – 2019 Wuzhen Contemporary Art Exhibition, gathering 60 leading artists and artist teams from 23 countries and regions, will hold its grand opening in Wuzhen, China on March 30, 2019. This art festival will bring together the works of a number of heavyweight artists, including the winners of the Pritzker Architecture Prize, the Venice Biennale Golden Lion, the Silver Lion at the Venice Film Festival Awards, the Turner Prize, and the Hasselblad Award. The unparalleled whirlwind of contemporary art will go a long way in making Wuzhen known worldwide as the go-to venue for similar and like-minded events. This exhibition will showcase 90 works of art from the 60 artists and artist teams, 35 of which are being shown for the first time anywhere worldwide. Thirty of the works were specially created for this event. Both in terms of the number and scale, this exhibition is a significant expansion when compared to the previous edition. A stylish exhibition, leading the trend of contemporary art, will be present in China's Wuzhen. Forty-eight artists are invited to attend the themed shows at the 2019 Wuzhen Contemporary Art Exhibition, at which, various forms of contemporary works will connect regional cultures while creating new possibilities in art. Venice Biennale Golden Lion winner Gregor Schneider's White Torture focuses on dialogue with space, triggering claustrophobic feelings among visitors. Yang Jiahui's unique sound device creates an impossible musical instrument to transcend reality. Wang Luyan takes the green brick on the square of the open-air cinema in Wuzhen and applies artistic creation to achieve the interaction between the environment and the local ecology. With the aim of exploring the artistic creativity of the new generation, this exhibition has brought together a team of young art critics – "How Far Off Is the Future" for the first time. As an integral part of the exhibition, the team will select 12 of the new artists as "finalists", then, in a second round, pick three among the final 12 as recipients of the prize, following each step of the traditional process, including nomination, exhibition and award, and, by doing so, mark the creation of an exhibition and communication platform that will make it easier for young and upcoming artists to get a toehold and become recognized in China. The event will bring the theme of "Now is the Time" to life through a unique link with exhibits across three exhibition spaces, North Silk Factory, Rice Barn and West Scenic zone. The contemporary artistic works to be displayed at Wuzhen West Scenic zone, where crisscrossing waterways and stone bridges present a unique watery landscape, will help create a fantastic environment where the old and the new co-exist. North Silk Factory, a witness to the evolving legacy of China's Industrial Age, has been renovated and transformed into a fully equipped art exhibition space. This year's event includes a new space, the Rice Barn, which was once used for grain storage and has since been renovated into a comprehensive modern art exhibition venue that continues to build a reputation as a desirable locale for exposing one's work. As the human, natural and architectural co-exist harmoniously in one environment, the unrivalled Wuzhen Contemporary Art Exhibition combines history and culture with modern elements to create a new artistic life experience. During the event, Pritzker Architecture Prize winner and artist master Kazuyo Sejima will create a new outdoor installation Another Layer of Surface Water on the southern side of the Dockside Boutique Hotel, reflecting the cultural and regional characteristics of Wuzhen. The new installation uses mirror materials to create a water surface-like effect, which is integrated into the surrounding landscape and reminds the town's denizens and visitors alike that life and art have been an essential part of everyday life in Wuzhen for centuries. Wuzhen, a modern hideaway as well as an artistic and cultural destination, is creating infinite possibilities for life. The "Now is the Time" themed 2019 Wuzhen Contemporary Art Exhibition is hosted by Culture Wuzhen Co., Ltd, sponsored and chaired by Chen Xianghong, and curated by Feng Boyi in partnership with Wang Xiaosong and Liu Gang. The event welcomes art lovers and life visionaries from around the world the opportunity to set sail on an aesthetic journey in Wuzhen from March 31 to June 30.